Nigeria’s female weight lifter, Ivory Nwokorie, has won the gold medal in the women’s 44kg power lifting at the on-going Paralympic games in London. 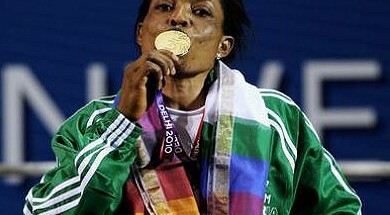 Nwokorie beat Cigdem Dede from Turkey, who won the silver medal, while Lidiia Soloviova of Ukraine claimed the bronze medal. Nwokorie, last year won bronze in the 44kg category at the third Fazaa International Para-powerlifting Championship in Dubai, to qualify for the Paralympic Games in London.